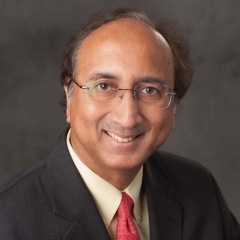 Vallabh Sambamurthy (Ph.D., University of Minnesota, 1989) is the Eli Broad Professor and Associate Dean of the MBA and Professional Master's Programs. He was the Chair of the Department of Accounting and Information Systems between 2012-17. He has previously served at the business schools at The University of Maryland and The Florida State University. He was associated with the successful launch of the top-10 MS program in Business Analytics at the Broad College. He is a leading global expert on how firms compete in the digital economy. His work has been funded by the National Science Foundation, Financial Executives Research Foundation, and the Advanced Practices Council (APC). He has published his research in top journals such as the Management Science, Information Systems Research, MIS Quarterly, Organization Science, and the IEEE Transactions on Engineering Management. He has served on the editorial boards of numerous journals, including MIS Quarterly, Information Systems Research, IEEE Transactions on Engineering Management, and Management. He was the Editor-in-Chief of Information Systems Research for a six year period during 2005-10. In recognition of the impacts of his scholarly work and teaching he was selected as Distinguished Fellow of the Information Systems Society at INFORMS (2011), Fellow of the Association of Information Systems (2009), and the Distinguished Alumnus of the National Institute of Technology (Tiruchirapalli, India). He has also been awarded the John D. and Dortha J. Withrow Endowed Teacher Scholar Award by the Broad College and the Excellence in Research awards by the Accounting and Information Systems Department. Recently, he received the William Beal Distinguished Faculty Award, the highest honor accorded by Michigan State University in 2014. Finally, in a recognition of his contributions to teaching, research, outreach and mentoring, the Association of Information Systems honored him with the LEO Lifetime Achievement award in 2017. Sambamurthy teaches courses related to the digital business strategies and innovation in the Full Time MBA program. He has been actively involved in executive education on current topics such as the shaping of digital business transformations, strategic alignment of IT, and the management of IT innovation in firms. He has worked as a researcher or a consultant with several Fortune 500 firms including AstraZenneca, 3M, General Dynamics, Owens Corning, Intel, Bell Atlantic, Freddie Mac, and BellSouth. His recently co-authored book, titled, Guiding the Digital Business Transformations: An Executive Agenda, provides actionable frameworks for achieving competitive advantage from information technologies. He is actively engaged with business executives and academics in China, Taiwan, Singapore, India, and Hong Kong in research, teaching, consulting, and executive education activities. V. Sambamurthy and Robert W. Zmud, Guiding the Digital Business Transformations: An Executive Agenda, Legerity Digital Press, 2012. Faisal Hoque, V. Sambamurthy, Robert W. Zmud, Tom Trainer, and Carl Wilson, Winning the 3-Legged Race: When Business and Technology Run Together, Prentice Hall, 2006. The people and programs of the Broad College play a starring role in this podcast series. The Department of Accounting welcomes Chris Hogan as department chairperson as Vallabh “Samba” Sambamurthy moves up. EY’s $1M Gift to Create Broad's "Analytics Collaboratory"
Both programs placed in the top 10 in the 2016 TFE Times rankings of such programs. Broad College faculty, staff, and students traveled to China to ensure top international students choose MSU. Thin Business Sparty is on the bullet train from Shanghai to Beijing this morning with Dr. Sambamurthy!